“Right now, Rikers Island is a case study in poor outcomes,” Stringer said, presenting data analysis by his office on large screens behind him. Stringer went on to point to court-mandated and other reforms being implemented at Rikers, but added that while changes are made, he believes the city must “plan for the day when Rikers Island can be safely and responsibly closed. Because part of the problem at Rikers is Rikers itself,” Stringer said to a crowd and panel of experts who appeared largely in agreement. 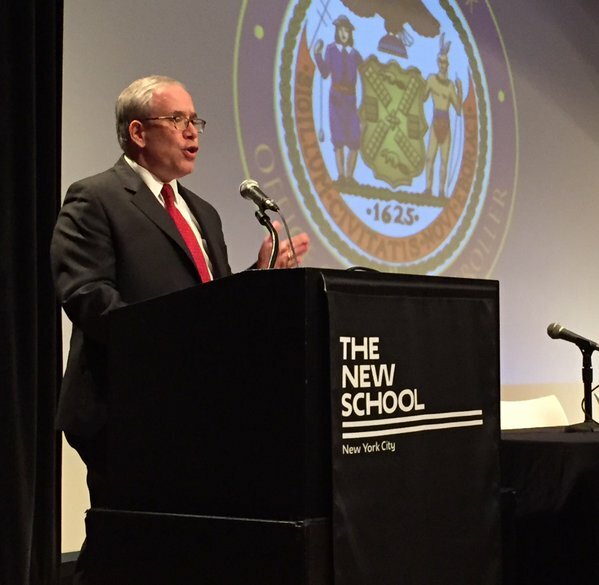 At the New School's Center for New York City Affairs on Wednesday, criminal justice experts and stakeholders discussed Rikers Island, home of the city's massive jail complex, where about 11,000 inmates, many of whom are awaiting trial, are held. Introductory remarks were made by Glenn Martin, founder of JustLeadershipUSA, who said that he had made a personal plea for shutting down Rikers to Mayor de Blasio on the mayor’s inauguration day. After Stringer spoke, a panel discussion ensued, with the organizing question of whether Rikers should be reformed or shut down. Overwhelmingly, panelists favored the latter. Other panelists included Neil Barsky, founder and chairman of The Marshall Project; Martin Horn, of John Jay College and formerly commissioner of the city’s correction department; Ann-Marie Louison, a co-director at CASES; Charles Nunez, a community advocate at Youth Represent; and Carmen Perez, a co-founder of Justice League NYC. It was moderated by NY1’s Errol Louis. The discussion took place following the presentation of striking data from Stringer: Riker’s cost per inmate (now $112,000 annually) has risen by 67 percent since 2007. 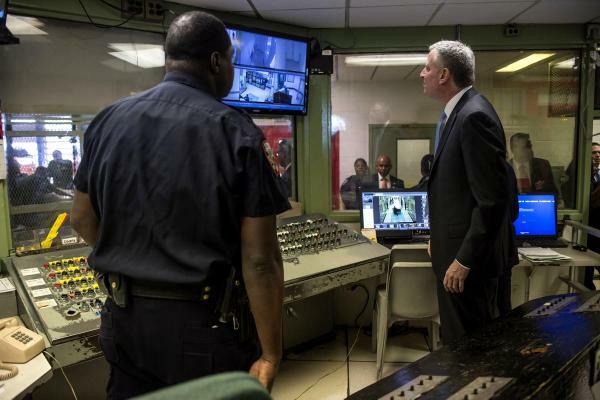 And while the inmate population is historically low, use-of-force incidents by uniformed Rikers employees increased by 27 percent and the number of assaults on guards by inmates by 46 percent in fiscal year 2015. 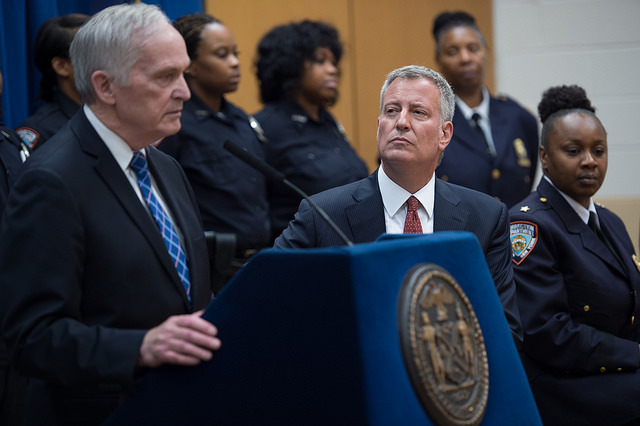 Reforms are currently being implemented by the Department of Correction under Commissioner Joseph Ponte and Mayor de Blasio. They are, in part, the result of a settlement between the city and U.S. Attorney Preet Bharara, who had joined a class-action lawsuit about Rikers, Nunez v. City of New York. “As we implement the consent decree, I believe we must also plan for the day when Rikers Island can be safely and responsibly closed,” Stringer said of the settlement. Calling for a shutdown of the complex, Stringer noted that one of the settlement details - the appointment of a federal monitor - has happened at Rikers before. Shutting the ten-jail complex down, Stringer added, would take “years of planning.” The mayor's office did not indicate there is any current consideratoin to begin that process in response to the Daily News. In his remarks, Horn said that finding space to replace Rikers would be difficult, but that it was truly a matter of political will. 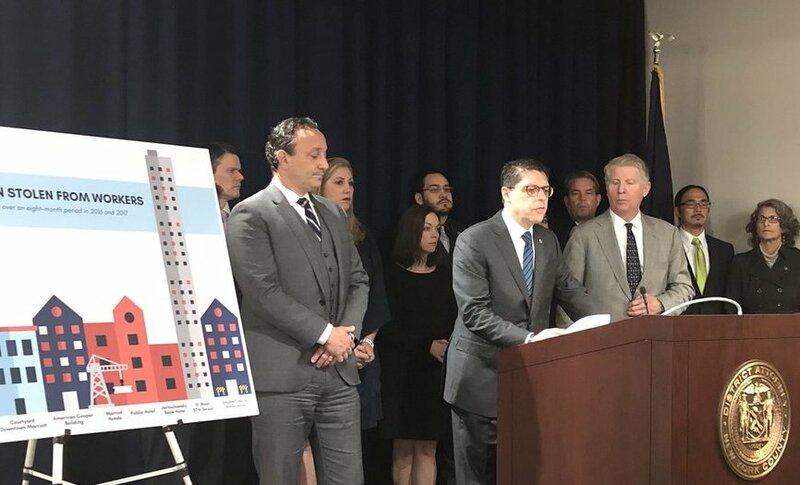 Horn outlined a plan for how to replace Rikers, but noted that any such planning would be at the mercy of about three Council members as it calls for modifying detention centers in Brooklyn, Manhattan, and Queens. But such solutions are not often politically popular. As he mentioned at the panel, Horn met resistance when, as DOC commissioner, he tried to reopen the Brooklyn Detention House to some inmates from Rikers. Former City Comptroller Bill Thompson successfully blocked the plan in court. In addition to New Yorkers preferring correctional facilities isolated, the political value of being seen as “tough on crime” could also impede a Rikers closing. In addition to that, Barsky said, the support of the major New York newspapers would be crucial to shutting down Rikers. Occasionally, local press has been highly critical of Rikers; 129 incidents of severe injuries to inmates were reported in a New York Times Rikers investigation last year. The New Yorker was highly praised for a piece on Kalief Browder, the teenager who killed himself after languishing for years on Rikers on charges of stealing a backpack that were later dropped. 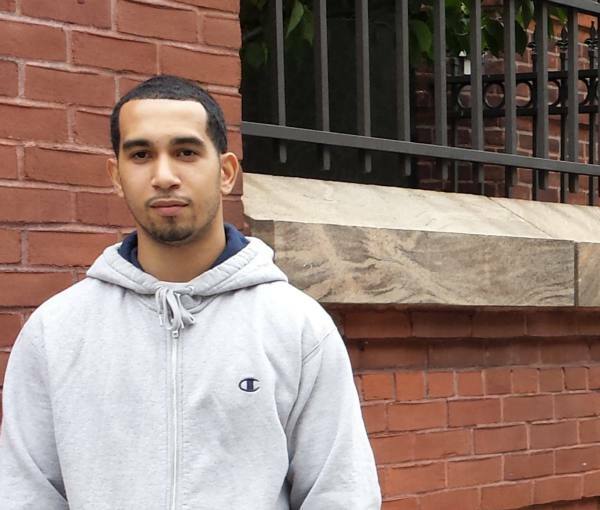 Rikers’ culture of brutality is viewed as central to Browder’s tragic tale. He is not alone in terms of inmates, as well as corrections officers, who are severely damaged by time on Rikers. “When you’re there, you’re not considered a person,” said Charles Nuñez, a community advocate who said he spent six months on Rikers himself. “You’re more acknowledged from your bed number or from your cell number,” he said. Mental health treatment on Rikers, the city’s bail system, and the age of criminal responsibility being 16 in New York State were also discussed as major problems at the panel. Even for those visiting Rikers, it can be a nightmare. 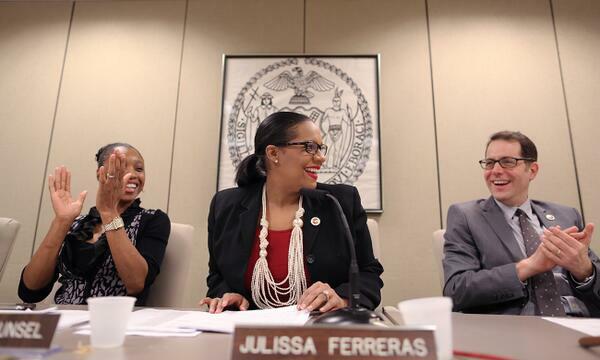 “Just the way in which you’re treated, regardless of your title, right?” Carmen Perez of Justice League NYC said. “You’re really stripped down of your humanity,” Perez said, discussing protocols for making female visitors change their clothes. In some quarters, the idea of closing Rikers has gained traction: City Council Member Daniel Dromm, of Queens, has said that closing Rikers should be a goal. Demonstrators voiced the demand last month, and it has become a popular hashtag. But no hope for its closure in the immediate future was expressed at the panel. “Can we envision Bill de Blasio running for office and saying ‘We’re going to close down these big out-of-date, poorly designed, dehumanizing factories of despair in Rikers Island and we’re going to build smaller jails for fewer people in Kew Gardens and Brooklyn Heights?’” Horn asked. Many in the audience laughed. Even if the mayor did, there would almost certainly be significant resistance in the neighborhoods targeted for new facilities: as Horn mentioned, there was an outcry among parents at St. Ann’s School in Brooklyn Heights when a federal pretrial services building moved near it.